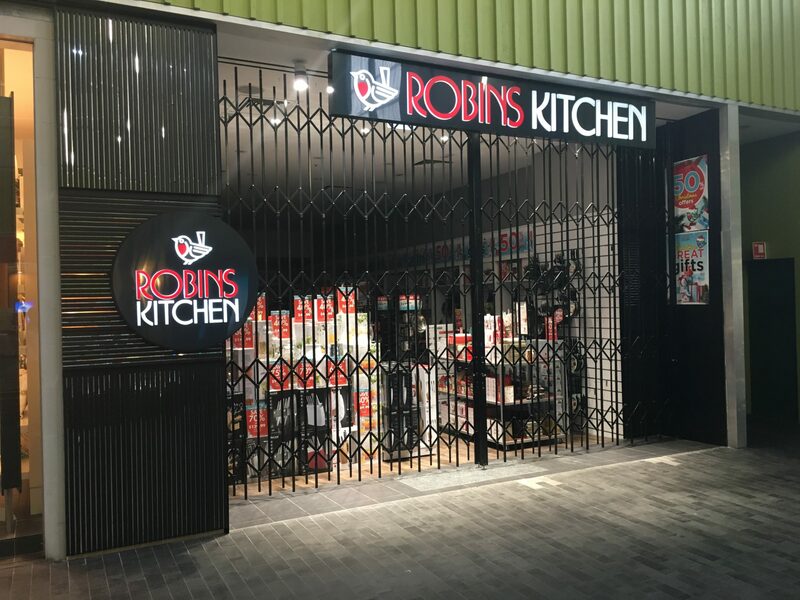 Australian Trellis Door Company™ (ATDC™) is installing its concertina security doors across the Global Retail Brands portfolio of Robin’s Kitchen and House stores across Australia. Global Retail Brands is Australia’s fastest growing and largest privately owned homeware and kitchenware retailer in Australia, operating in all states and territories. Specified by well-known Melbourne based retail and commercial design specialist ACRD, ATDC’s S07-2 side- by- side stacking concertina security doors are being widely used as they are the most space efficient commercial door closures currently available on the market. The doors are configured on a parallel set of tandem top tracks; these concertina security doors fold back to only 8 per cent of the total opening width being secured. They are complemented by a series of secure full height up/down locking mechanisms to alleviate the need for any floor tracks, creating a seamless effect with a completely clear and open shopfront without any obstructions during trading hours. Where required, a curved or S-bend configuration with 90 degree turns over a 600mm radius can be achieved for securing curved apertures. More information here on the S07-2 concertina security doors. These concertina security doors have added advantages for designers and retailers including the fact they require no headroom at all and can span unlimited widths. Maximum recommended heights are 4200mm and being an open grille these doors are fully ventilated and are a merchandiser’s dream allowing for maximum showcasing of retail products on display. View our range of Security Doors here. ATDC is working with some of Australia’s leading shopfitters on this prestigious rollout for Global Retail Brands including Melbourne based firms Clarke & Doggett and One68. (For other similar projects and applications for the S07-2 please see company article on our website here). ATDC’s extensive range of concertina security doors are now available for sale in Sydney, Melbourne, Brisbane, Adelaide, Perth, Canberra, Darwin, Newcastle, Geelong, Townsville and in all regional towns and centres across Australia. The range includes commercial, industrial and residential doors. For more information visit ATDC’s website here or contact ATDC by telephone toll free on 1800 657 435.